It was about five years ago that I discovered the book The Secret for the first time. I had heard several of my friends talking about it, how it changed their perspectives and thoughts, and how it made them more positive in general. Naturally I was intrigued, so I bought the book and have never looked back since. For those of you not familiar with The Secret, this might all sound a bit far-fetched but when you read it, it makes you examine the way you’ve been thinking and acting your whole life. It has one simple premise – what you give out you get back. In other words, if you’re a positive person – if you think, act, and feel positive, then you can only attract positive things. The more I read, the more it made sense to me, and I became obsessed! I got the audio book to listen to in bed at night, bought the DVD, I bought the follow on book, The Power, then bought the audio book version. But although logically I understood everything the books were advocating, I never really knew how to put it all into practice. That was, until Rhonda Byrne released the third book in The Secret series, The Magic. The Magic is a 28 day step-by-step guide on to how to make your life more positive, and helps you put everything The Secret teaches into practice. As dramatic as it sounds, this book single-handedly changed my life. Each day you are challenged with undertaking a different task around positivity, and a couple of days in, one of the things it says to do is to create a vision board of everything you want. By putting images of all the things you want in one place and looking at it every day, your mind is focussed on attracting all those things to you. In January 2013 when I started reading The Magic for the first time, I was just made redundant from my job, I was facing into my fifth year of being single, I was back living at home with my parents, and I didn’t know how to change any of it. 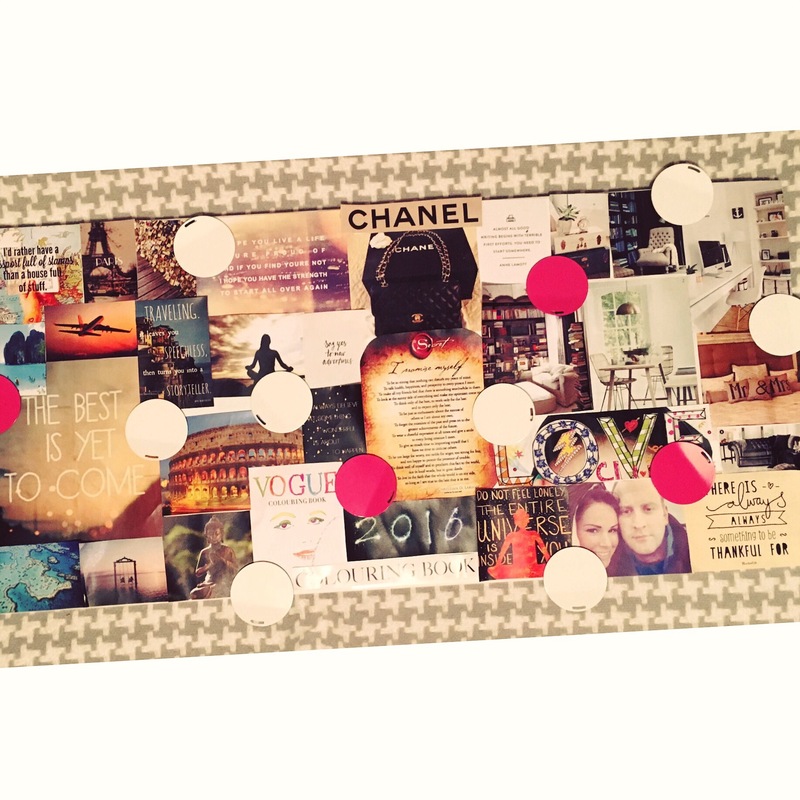 After reading about vision boards and the power of positive visualisation however, I decided to bite the bullet and give it a go. I created a board out of magazine cut outs, quotes and pictures representing all the things I wanted – a new job, finding ‘the one’ and getting engaged by the following year, moving out of home again, and generally becoming happier. I had my doubts that it would work – how could any of this could possibly happen from looking at pictures?! But within three months I had found an amazing new job, I met a guy, and by the end of the year, that guy had turned out to be the love of my life, and we moved in together. I had a new job, a new home and I was no longer single. Fast forward twelve months to autumn 2014 and I was also engaged. But most importantly of all, I was very happy. You could say it was just coincidence, but I don’t believe that. 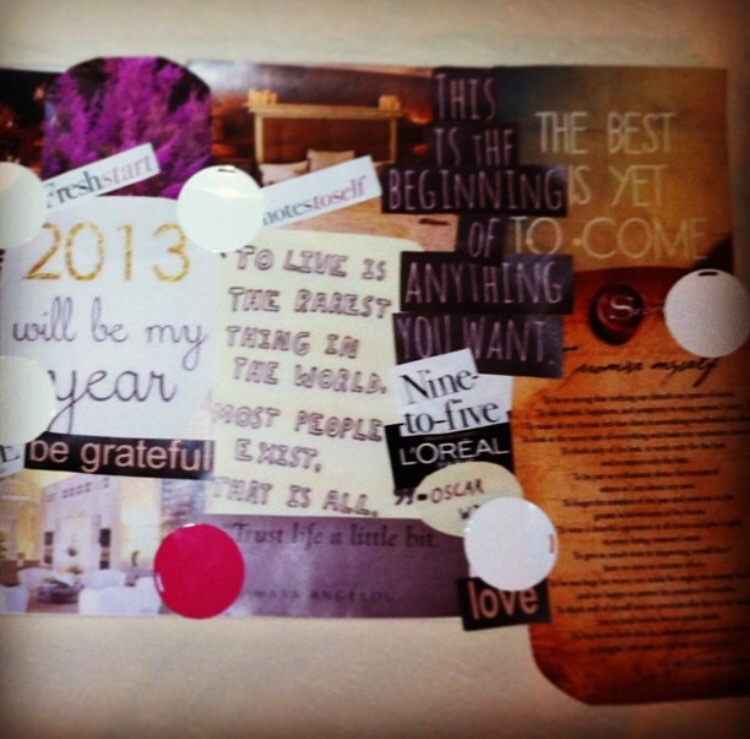 I will never again doubt the power of positive thinking and since that year, every January I create a vision board for the year ahead. They vary each year of course, but they always include my favourite quotes and The Secret teachings. 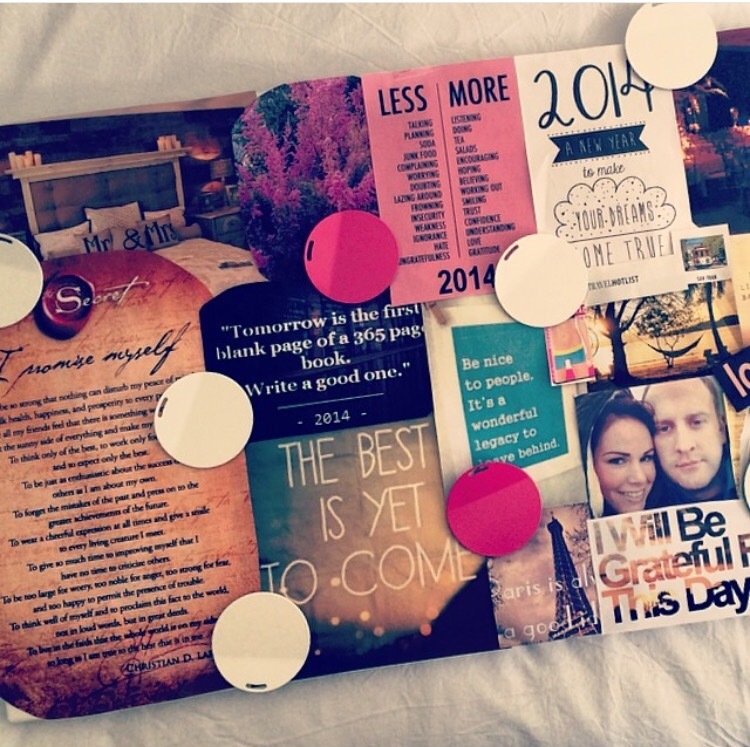 Last year my board was all about our wedding and going on a fabulous honeymoon – I even created a second very wedding-specific vision board but I’ll go into that in more detail another time! My board will be hanging on the wall beside my bed until the 31st December. For 2016 I’m focussing on travel, on working towards buying a new house and making more time for myself. I will look at it first thing every morning and last thing every night, and will visualise all of these things happening for me this year. If you’re sceptical I understand, I was too. But why not give it a go and see what happens?